A new wine bar recently opened in my neighborhood, and given all of the local buzz about it, specifically through the Times Union Table Hopping blog and also from some co-workers, the time between opening and my visit was only a few weeks. I actually tried the restaurant during Guilderland restaurant week (January 22-28, 2012) because the special menu seemed authentic and interesting enough to give it a shot, and, for $20.12, it is a good way to sample a restaurant at it’s best at a low price. Their regular menu also has a number of items that seem like they would appeal to me. The restaurant is very cosy and warm. 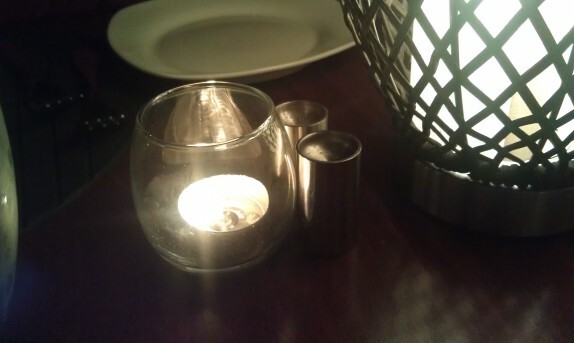 Things feel pretty modern, even the cute little salt and pepper shakers that are on the tables. After we placed our order, the young lady returned from the kitchen with a complementary small plate of pickled fruit for each of us. 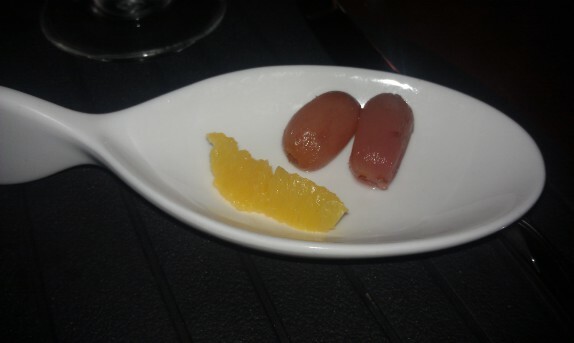 We were each given two interesting and delicious pickled grapes with one slice of mandarin orange. 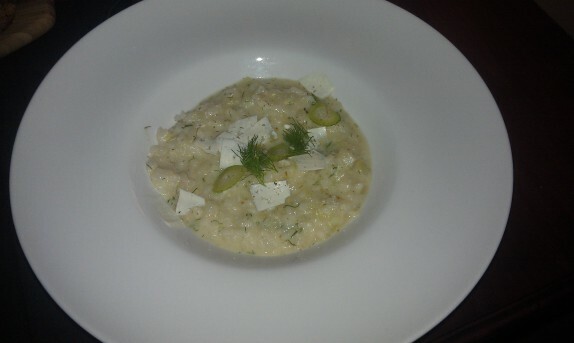 I actually wanted to start the meal with a different starter than the restaurant week starters, so I ordered the Fennel Risotto ($9 – Glazed Fennel & Ricotta Salata). This dish was perfect. I am serious. It was served on a warm plate, and was creamy and balanced. The risotto was cooked to perfection, with an ever-so-slight bit of texture to the rice. The fennel flavor did not overpower the other flavors in the risotto, and the shavings of ricotta salata on top added a salty bite every so often. 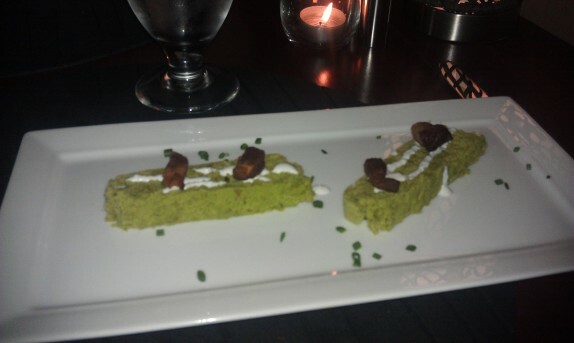 The restaurant week starter I picked was the Sweet Pea Terrine (Horseradish Crème Fraiche & Crispy Bacon). After the great experience with the risotto, this seemed a whole lot less interesting. The flavors were nice, but it was a cold pea terrine, so there was a gritty texture that I didn’t quite enjoy. The crème Fraiche was applied sparingly, but was delicious, and the bacon was bacon. 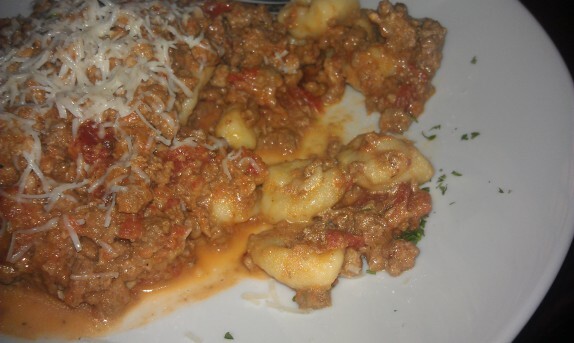 My main plate was the Potato Gnocchi Bolognese (House Made Gnocchi with Meat Sauce & Pecorino Romano). This dish was very good. I very much appreciated the hand made gnocchi, as it is a very simple pasta dough to make; every restaurant serving gnocchi should be making their own. My gnocchi tasted great but were cooked just a touch too far, but I believe the piping hot Bolognese sauce to be to blame for this. 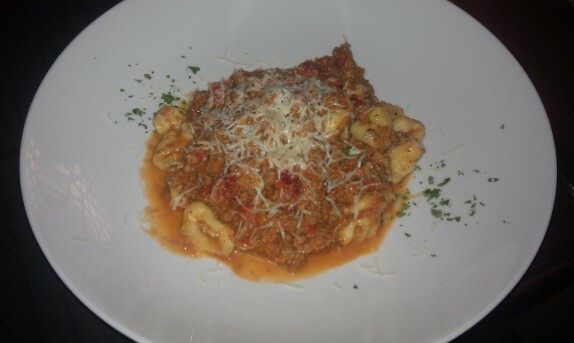 The sauce was meaty, spicy, and creamy from the Romano cheese. This was a very good dish, and the portion was modest. Put it this way: they gave me way more than I expected to get for the restaurant week price, and it was of superior quality, bottom line. My dessert was the Crème Brulee, although I got to try each of the goodies in Cassie’s Ice Cream & Sorbet Tasting (which were awesome, and homemade). 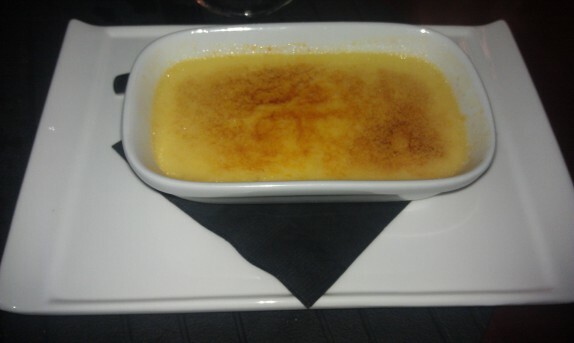 The crème brulee was great. They were conservative about how torched they did the sugar on top, and, around the edges, the shell was weak. The custard was pretty good and was a great way to end the great meal. 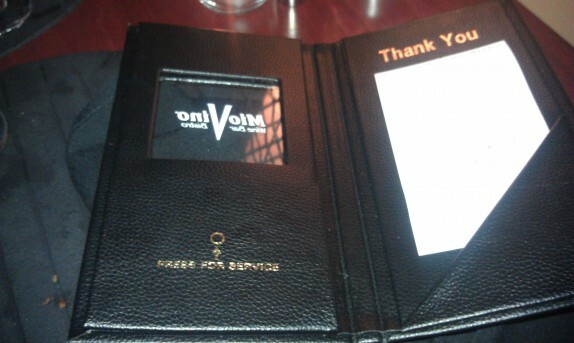 When the waitress delivered the bill, it came in a cool book that was equipped with a light to inform the server that the payment is enclosed. This is an awesome idea! I love toys. The overall service was very fast. If we were there for more than 75 minutes, it would be an over exaggeration. Right after we paid, one of the patrons came over to ask about our dinner. He was very charming and friendly. I was honest about the overcooked gnocchi, but was also honest about the perfect risotto. He loved the feedback and wished us a great evening. He even saluted us at the door on the way out to remind us to drive carefully because cops are all over the place in that village. 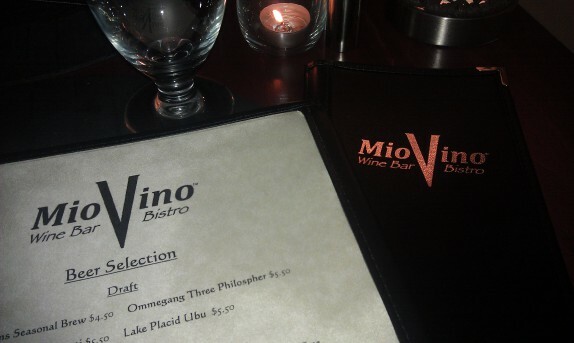 I will definitely be back and urge you to try Mio Vino, if for no other reason than to taste what perfect risotto is. This is high praise indeed from someone who takes risotto as seriously as you. I’ll have to ratchet this place up a bit higher on my to do list. This place is my new favorite restaurant. I was there a week ago —had the wedge caesar salad and the Ricotta Ravioli with Butternut Squash cream sauce…to die for. My notoriously picky friend had the Duck special and it was also amazing –Service was great, food was exceptional, lovely ambiance, and all within a ten minute drive from home.